With thousands of proposed dams threatening Europe’s few remaining free flowing rivers, France’s decision to remove two large dams could signal the start of a new era on the continent – with countries focussing on reviving their rivers and on large scale dam destruction rather than construction. 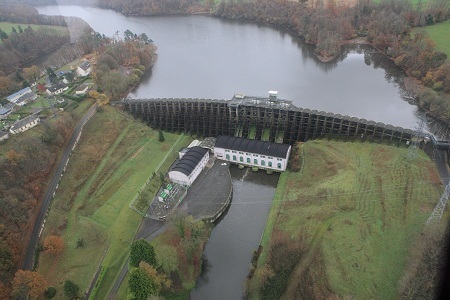 Eight years after the idea was initially discussed, the French government agreed last week to remove the 35 metre-high Vezins and 15 metre-high ‘La Roche qui boit’ dams from the Selune river in Normandy in 2018. With France leading the way, countries from Spain to Finland have taken down many small and obsolete dams in recent years, but freeing up the Selune represents the largest dam removal project so far in Europe – and a major step towards bringing life back to the river, including wild salmon and eel whose migrations have been blocked by the dams for decades. Fragmenting rivers with dams, barrages and other infrastructure has played a major role in the catastrophic loss of fish and other freshwater species across the continent. Removing these concrete obstacles will help to reverse this trend and provide other benefits to communities along Europe’s riverbanks, including income from the anglers who will follow the fish back to the rivers. Indeed, fishing associations have long worked with French environmentalists to bring down the two Selune dams as part of the ‘Friends of the Selune’ coalition (see the attachment for a list of members). The project is aligned with France’s commitment to the conservation of its remaining wild salmon and eel populations and with the requirements of the EU Water Framework Directive.